Some people try to avoid persecution, but there’s every reason to embrace it. One way to avoid being persecuted is to never speak about your faith in Christ. If you never mentioned the gospel and why lost people need Christ, then you won’t have any persecution because no one will know you’re a believer. Jesus has some words about that, saying, “whoever denies me before men, I also will deny before my Father who is in heaven” (Matt 10:33), so “For whoever is ashamed of me and of my words, of him will the Son of Man be ashamed when he comes in his glory and the glory of the Father and of the holy angels” (Luke 9:26). Think about this; you have news about the only way people can escape the wrath of God. If you kept the cure to cancer to yourself, that would be criminal, but how much more important when we’re talking about where a soul spends eternity. Yes, we must let our light shine but words are necessary, because the power of salvation is in the gospel (Rom 1:16; 1st Cor 1:18), not in our example. The New Testament church knows nothing of silent Christians or those who keep quiet about their faith in Christ. If you have been persecuted for trusting in Christ, you are joining a long list of people who came before you. These, who came before us, and you, have all been persecuted for their faith. Some lost everything, some lost their families, some became wanderers, some beggars, and others lost their lives, but they understood that if all they had was Christ, they had all they needed. Let Jesus’ words encourage you when you’re persecuted for His name’s sake. He doesn’t’ just say, “be happy about it, but, “Rejoice and be glad, for your reward is great in heaven, for so they persecuted the prophets who were before you” (Matt 5:12). You are joining some elite company when you are despised for Jesus’ sake. And why should we rejoice about it? It’s because, “your reward is great in heaven.” The author of Hebrews writes that “you had compassion on those in prison, and you joyfully accepted the plundering of your property, since you knew that you yourselves had a better possession and an abiding one” (Heb 10:34). Losing everything but gaining infinitely more of everything in Christ should help us endure the words that can hurt us, insult us, call us names, and be spoken evil of on account of Him. After the apostles left the Sanhedrin, and after being beaten, “they left the presence of the council, rejoicing that they were counted worthy to suffer dishonor for the name” (Acts 5:41). You might not be imprisoned or beaten for your faith, but words are far worse than sticks and stones which bring wounds that can heal. You who are blessed are those who are persecuted. Wait, doesn’t that go in reverse order? Just think of the blessing first when you’re persecuted, and thank God that you must be doing something worthy of being persecuted. To begin with, the Apostle Peter tells us that we should “not be surprised at the fiery trial when it comes upon you to test you, as though something strange were happening to you” (1st Pet 4:12), but rather, “rejoice insofar as you share Christ’s sufferings, that you may also rejoice and be glad when his glory is revealed” (1st Pet 4:13). And if it even comes down to being insulted “for the name of Christ, you are blessed, because the Spirit of glory and of God rests upon you” (1st Pet 4:14). If I asked for a show of hands in our church about “Who would want to have ‘the Spirit of glory and of God rests upon you,’” I’m sure nearly every hand would shoot up, but if I ask them, “How many want to be insulted because of Jesus,” maybe not as many would want that. In our flesh, we don’t like to get outside of our comfort zone, but what a blessing we miss, because “Blessed are you when others revile you and persecute you and utter all kinds of evil against you falsely on my account” (Matt 5:10). When someone mentioned at the Bible study that their sister persecutes her all the time for her faith, someone responded, “Why not unfriend her on Facebook?” but is that the right response to persecution? Once again, we turn to Jesus Who tells us how we should respond, saying, “Love your enemies and pray for those who persecute you, so that you may be sons of your Father who is in heaven. For he makes his sun rise on the evil and on the good, and sends rain on the just and on the unjust” (Matt 5:44-45). When you’re insulted on social media or in person, don’t call the ACLU or a lawyer, but “Bless those who persecute you; bless and do not curse them” (Rom 12:14), and “Repay no one evil for evil, but give thought to do what is honorable in the sight of all” (Rom 12:17). Here is what we must do to those who are our enemies and enemies of Christ; “if your enemy is hungry, feed him; if he is thirsty, give him something to drink; for by so doing you will heap burning coals on his head.” Do not be overcome by evil, but overcome evil with good” (Rom 12:20-21), and most of all, “never avenge yourselves, but leave it to the wrath of God, for it is written, “Vengeance is mine, I will repay, says the Lord” (Rom 12:19). If someone says, “I believe in Jesus Christ,” and yet has never suffered for His sake, then a self-examination might be in order. 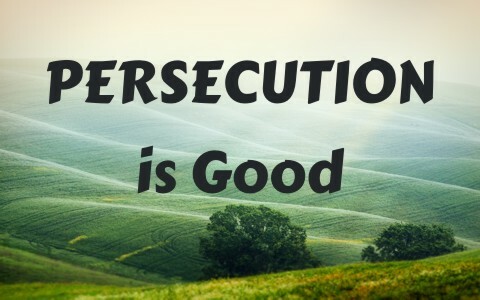 The Apostle Paul said that persecution wouldn’t come only to some, or even a majority, but persecution would come to all who professed Christ and lived a life accordingly. Paul wrote that “all who desire to live a godly life in Christ Jesus will be persecuted” (2nd Tim 3:12), and there is no way to remove the context of “all” being all believers. If you’ve never been persecuted, you are either not desiring to live a godly life, perhaps meaning you are living in sin, or you have never shared your faith with anyone, or you might not even be saved. Today is the best day to trust in Christ (2nd Cor 6:2); tomorrow may be too late (Rev 1:7). Previous post: How Do You Practice The Pure Religion Of James 1:27? Next post: What Will People Wear in Heaven?